Rinse freekeh in a colander. Bring a medium pot of water to boil and add the freekeh. Bring the water back up to a boil, then cover the pot and reduce the heat to low. Simmer for 15 to 18 minutes, or until the grains are tender (but will remain chewy as is their nature). Drain any excess water and set aside. In a skillet heat the oil over medium heat. Stir in the garlic and cook for just a few minutes, or until it starts to very lightly brown. Fold in the zucchini and the salt, and stir well. Push the zucchini around the pan so the cubes are in as much of a single layer as possible. Increase the heat to medium-high and cook until the zucchini browns evenly, about 8-10 minutes. Meanwhile, make the dressing: whisk the lemon juice and shallot together in a small bowl and set aside for 10 minutes. Then whisk in the olive oil, vinegar, Parmesan and salt. 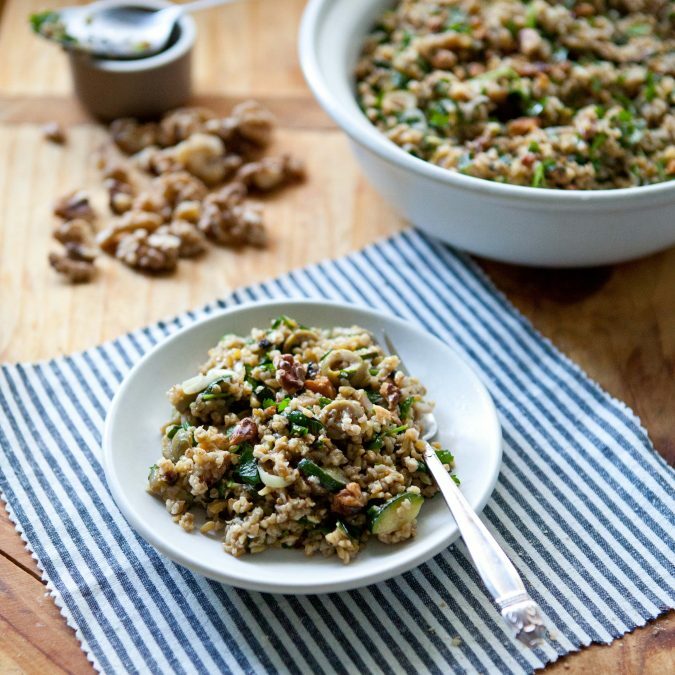 In a large serving bowl, toss together the cooked freekeh, sautéed zucchini, leek, toasted walnuts, green olives, parsley and dill. Dress the salad, taste and season with additional salt and black pepper, as needed.